We stayed in Kathmandu long enough to visit Bodnath, collect passports complete with Pakistani visas and heal stubborn Khmubu coughs. Bodnath was amazing but as it turns out though, Nepal is the worst place to heal coughs- Kathmandu (Dustmandu) is at constant battle with dusty haze. People sell a range of attractive dust masks by the side of the road ranging from your run-of-the mill surgical mask, to builder’s masks, to decorative knitted masks, to ninja masks, to colourful scarfs designed to wrap around the mouth and nose. Although their effectiveness is questionable, at least you’re trendy by wearing one! 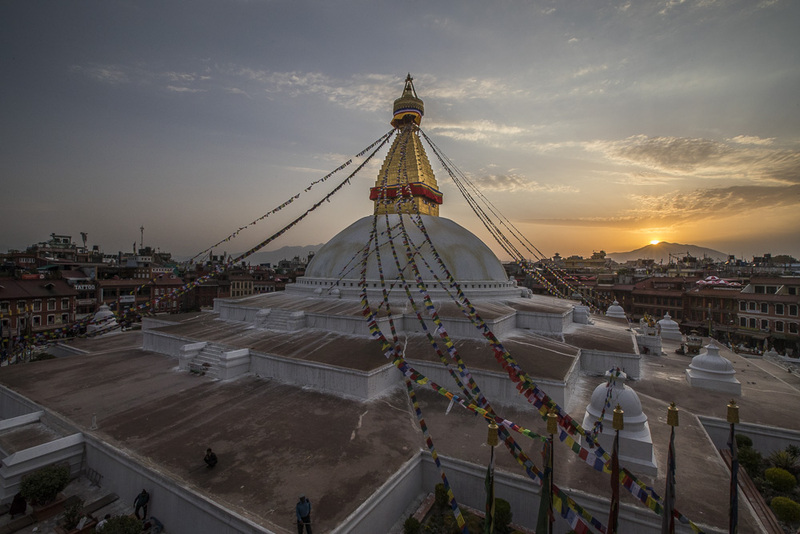 With a cough still lingering and a storm cloud hanging low over Kathmandu, we made our way west towards Lumbini. Just as the road out of Kathmandu became very steep, decidedly muddy and narrow thanks to the ever trusting maps.me suggested route, we asked a passer-by if this was the most sensible way to Lumbini, given that the first few fat drops of rain were starting. He laughed and said that the road did go to Lumbini, waving towards some high mountains, but that it would take us over a day on the precarious winding pathway which was too narrow for cars but a bike could maybe do it. The ”maybe” sold us on turning back to the highway road out of Kathmandu. Back on the main road out of the city which had been churned into a muddy set of valleys thanks to the trucks, road works and rain, we jumped and slid our way out towards the motorway down west towards Pocara. The rain continued more persistently through the gentle hairpins until it was bucketing down just before the left turn we needed to take to get to Lumbini. We spotted a tree and people drinking chai and decided it was a good place to pull over and wait. The rain was so strong that the tree offered little protection but we hoped it would be enough to avoid embarrassing NorthFace again by proving that their waterproof bags are not that. As it turns out, the chai drinkers were traffic police who invited us in for chai and rest. They explained that this patch of road makes a lot of money as everyone speeds but that they never stop foreigners because they tend to be OK drivers. Funnily enough, we’d noted that the foreign vehicles were the only ones to not speed on the roads. The rain showed no signs of stopping but it did reduce in intensity. We decided to keep going as Lumbini was a long way away and it was already 10am. We came to the left turn and were immediately confronted by a red cone in the road. Stopping for a moment, another bike pulled up next to us. Soon we were at the head of a really long queue of traffic. Confused as to the cones and barriers, the biker got off and spoke to a worker and luckily he explained to us the situation. 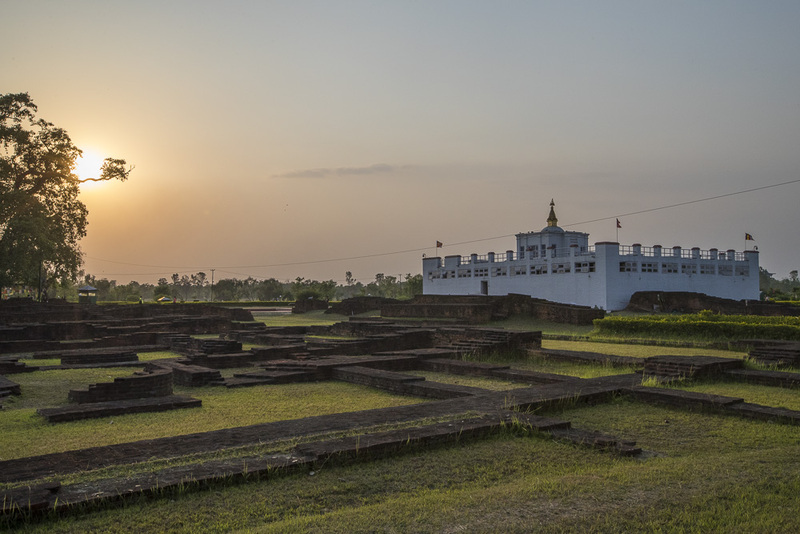 Clearly we needed to change the plan so we re-joined the highway and made our way instead to Pocara, deciding that Lumbini could wait another day. The change of plan was a lucky one. 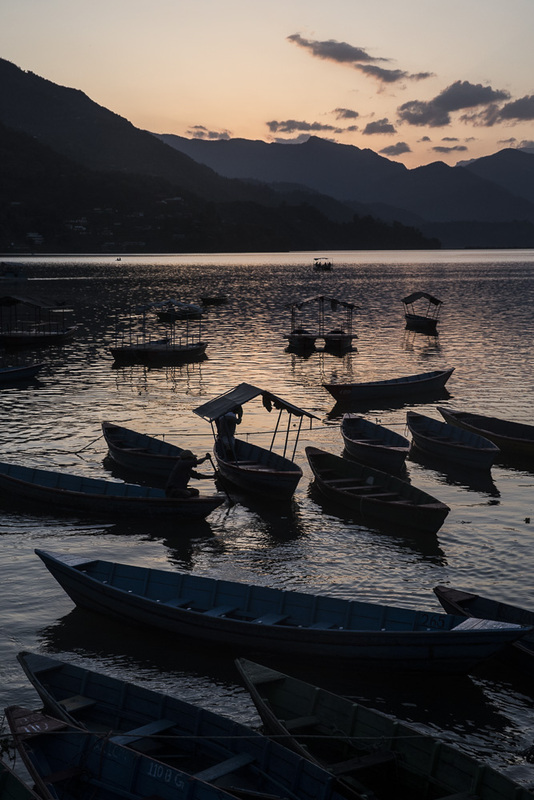 Pocara is beautifully situated next to a lake in a valley with the Annapurna range as a backdrop. We came into a sunny and clean town filled with shops and funky cafes, clearly a touristic destination. 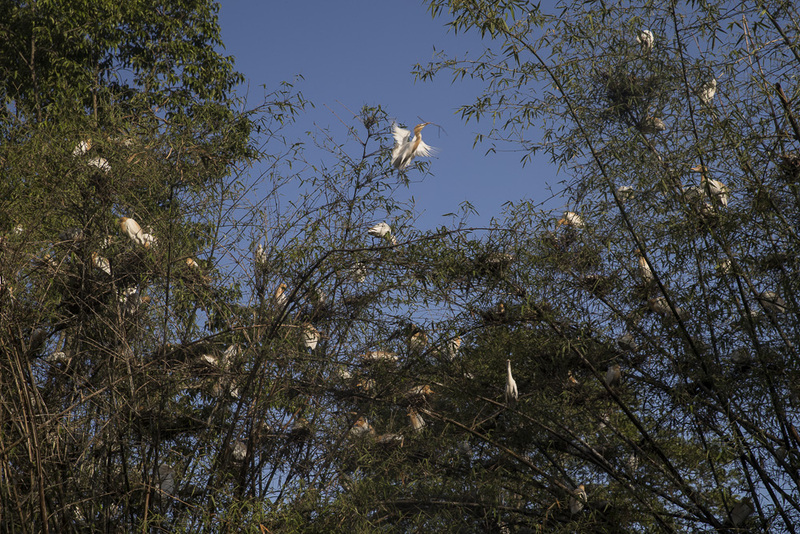 The trees were filled to bursting with birds and the lake was busy with small boats. 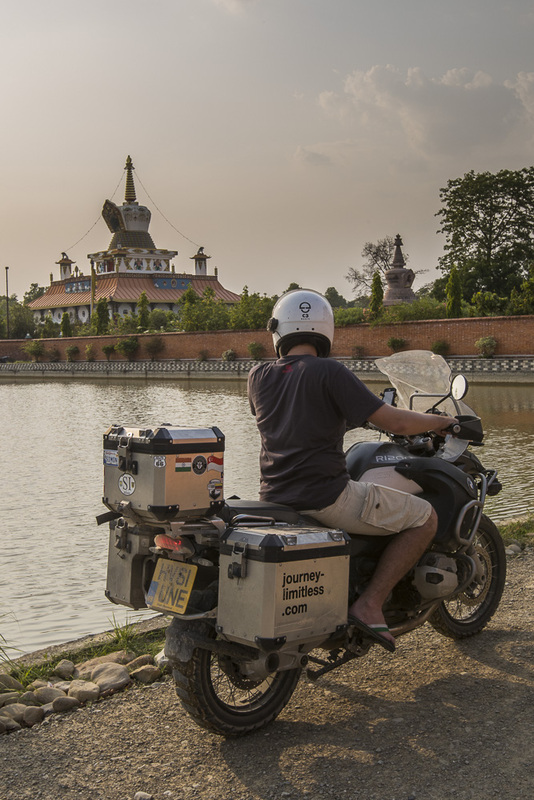 After a quiet evening drying off from the rain and enjoying the sunset over the lake, we prepared ourselves for our way to Lumbini. 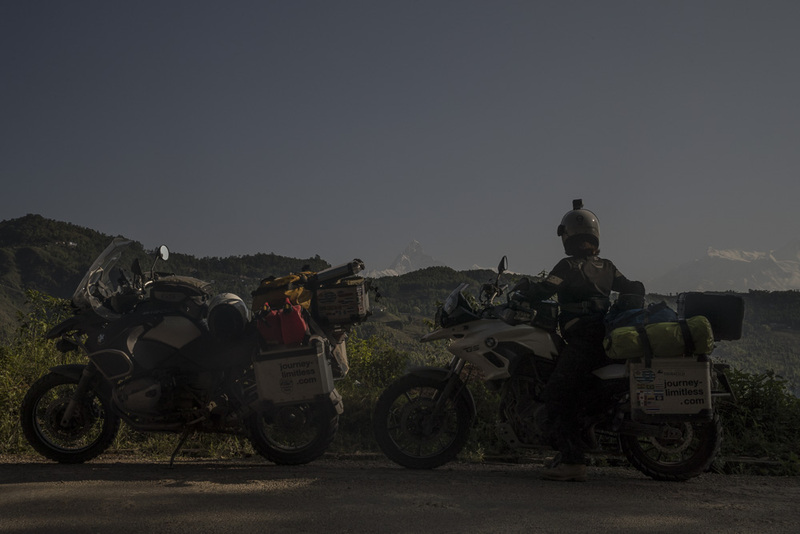 Leaving by 7am, we rode along the Annapurna mountains, counting them off along the way and stopped off for a breakfast of Samosas and breaded boiled eggs. The highway was beautiful in the mountains, really windy and through tiny villages of just a few houses. Stopping for a drink, the shop keeper handed Simon a fresh cucumber just picked which was more refreshing than the juice we’d bought! Fearing an intestinal dropkick, Alex avoided it. The road was mostly good but at times, sections had been pre-prepared for future work and the worst parts of the tarmac were removed, leaving sections of compressed earth and gravel exposed to the traffic. Speeding cars grind to a halt on these sections and crawl over, achingly slowly, lifting dust and small rocks in a veil in front of us. We pulled over to take photos of some impressive rock formations (to entertain Alex’s geologist colleagues) only to notice a massive nail poking out from Freja’s rear tyre. It had embedded itself carefully between the deep treads and appeared to be 90% inside the tyre. Being that the tyres were tubeless this was a ticking time bomb. Deciding that it had embedded in Kathmandu (there were rough bits) and that it had made it this far, we would struggle on to Lumbini and see what we could find there. Alex rode the bike gingerly and with far more care to avoid any pointy looking rocks loading directly on the nail. 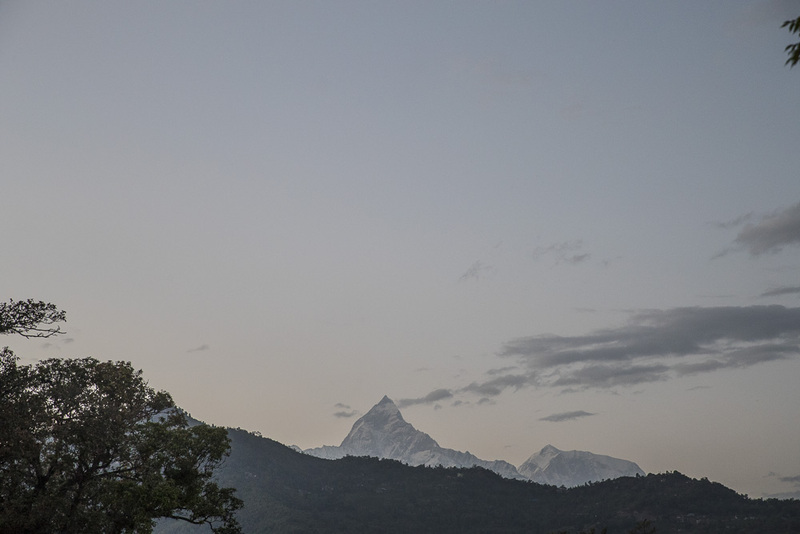 Having held her breath for the entire road, Alex was glad when Lumbini was finally in sight. The mountain highway (Siddhartha highway) finally rolled us out onto a dual lane carriageway with relaxed drivers which was about 10km long before crumpling back into gravel and dust. 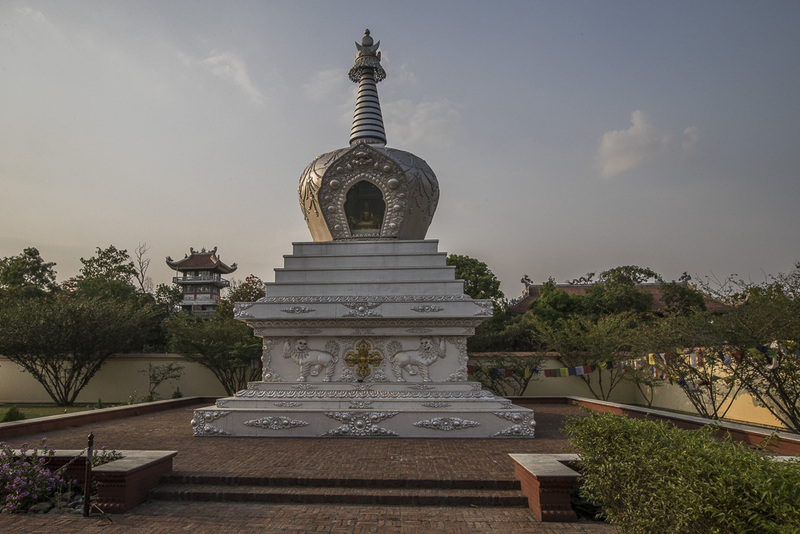 Lumbini was smaller than expected- only a large park filled with stupas and surrounded by a few small streets boasting one or two restaurants and a single bank. We parked the bikes, had a much needed shower after the anxiety of the nail incident and made our way into the park on the bike. The park is still under construction but has some fabulous structures already on display. First we visited the peace pagoda which in the brilliant sun shone and gleamed impressively. Having taken off our shoes we were completing our circles of the pagoda carefully, trying not the burn our soles. 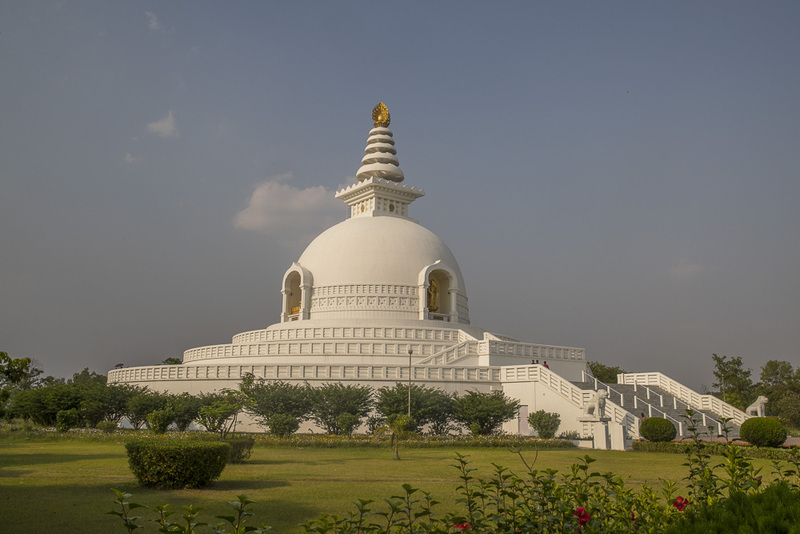 Conscious of the strict 17:30 closing time, we rushed around the stupas to see the different architectural styles. Luckily the Germany funded stupa was still open (the French clocked off at 17:20) and the museum stayed open until much later. 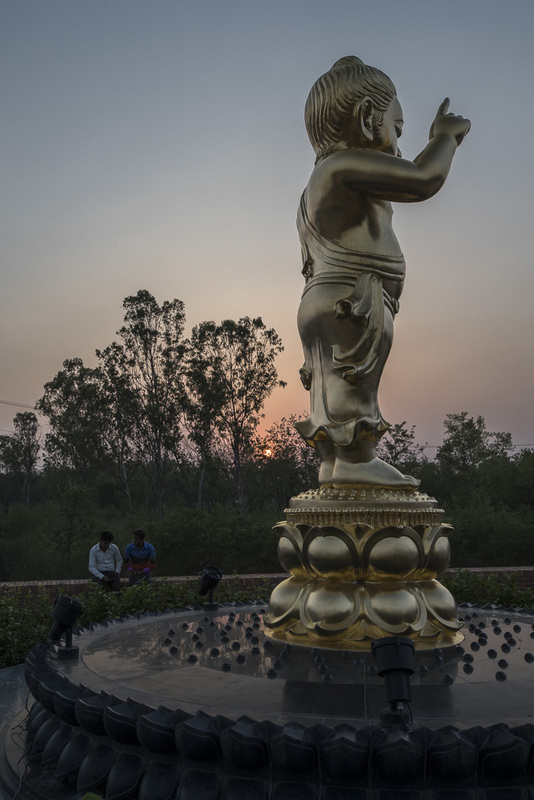 We even saw the ruins of the birthplace of Buddha including a statue of Queen Maya and the Buddha on the exact spot of his birth. 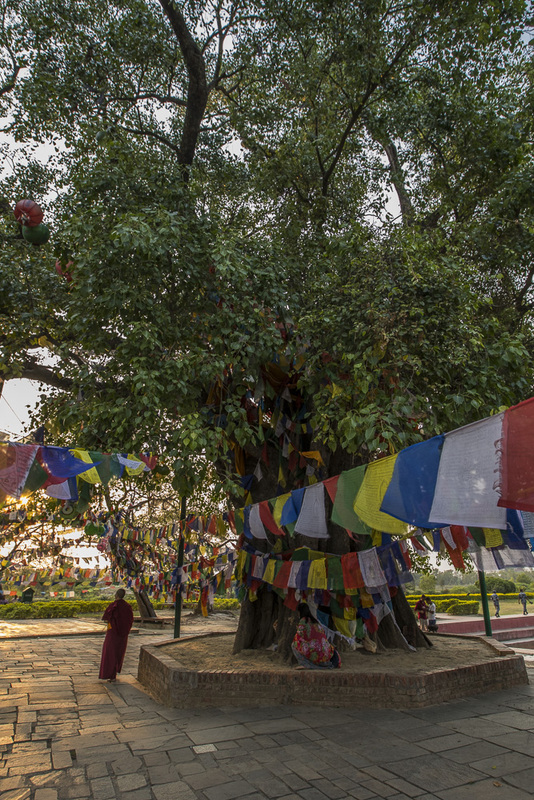 Outside was a sacred Bodhi tree and ruins of the previous Mayadevi temple. People were leaving offerings a prayers at the base of the tree and a small striped squirrel was stuffing its face with the offerings as soon as they’d been laid! It was truly beautiful particularly in the sunset. Once the sun was gone, the whole park shut and we were left with only the canals and parks to explore. Still under construction, the final design will be a central canal with brick arch bridges and canal offshoots towards the stupas on either side. Some had chosen to ride bicycles across the park which seemed a far better idea than a throaty, loud motorbike! Exhausted by the day’s ride and the park tour, we settled down for the night and wondered what India would bring the next day. Unfortunately the hotel room we booked seemed to come with extra mosquitoes and they feasted on us all night long so sleep was very hard to come by. We did eventually fall asleep, ready to face the challenges of India once more. More stupas from the site, like Disneyland for Buddhists!